A new European energy label for refrigerators and freezers, washing machines, dishwashers, and TV sets is effective as of today. The new label was approved on May 19th 2010 by the European Parliament with the Framework Directive 2010/30 EU. 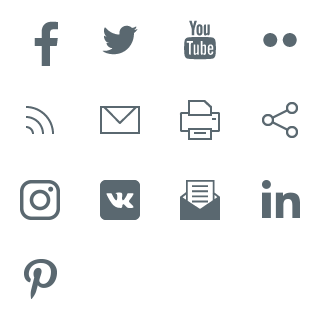 Novelties include the option of including three new classes A+, A++, and A+++, and introduction of nonverbal, universal communication employing pictograms. The use of the new label will be optional in an interim period of one year; after 12 months, it will be mandatory for suppliers to attach the new label to each product. 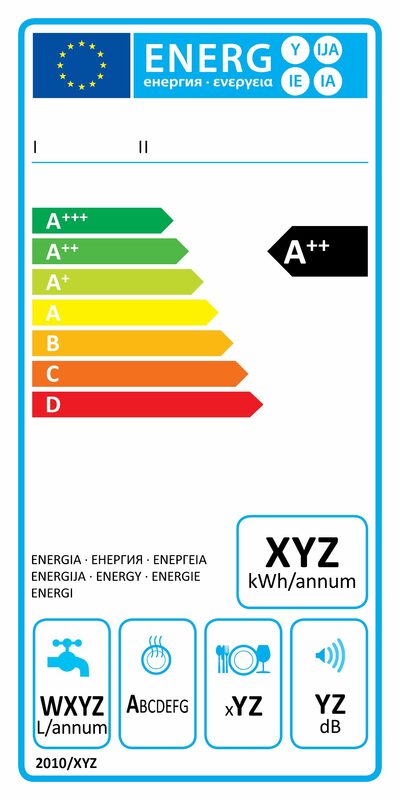 Energy label was introduced in European markets in 1995. Its basic purpose is to provide standardized information to consumers about power consumption and other characteristics and performance of major appliances, and thus to aid the consumers in choosing the most efficient product. In this sense, the energy label has also had a key role in motivating the improvement of energy efficiency of major appliances, setting an example for other countries in the world. The label helped steer the manufacturers' development activities in such direction that today, most products are rated in the highest energy classes. In order to sustain its basic purpose, i.e. to aid the consumers in their purchasing decisions, the label required revision. Hence, on May 19th 2010, the European Parliament adopted, based on proposals by the European Commission, a new Directive 2010/30 EU which lays down the key principles and liabilities, including Regulations for product groups refrigerators-freezers, washing machines and dishwashers, and TV sets. Regulations for other types of major appliances will soon follow. The new label has retained the distinctive design and classification of products into seven energy classes from A to G, colour-coded from dark green (high energy efficiency) to red (low energy efficiency). The label format was also kept. Novelties include the option of including three new classes A+, A++, and A+++, and introduction of nonverbal, universal communication employing pictograms. 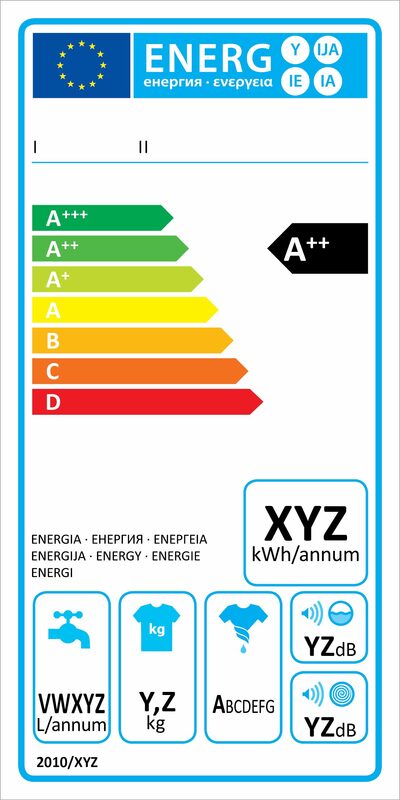 The new energy label also includes general information such as noise level and methods applied to define the energy class and to calculate the energy efficiency index, depending on the type of the product. For suppliers, most obligations remain the same. They must deliver to retailers products fitted with energy labels and provide standardized information on the product in all documentation and info material; furthermore, they are responsible for accuracy of the information provided on the labels and in standardized data tables. Retailers, on the other hand, must display the label at the point of sale in a clearly visible spot, at the front or upper part of the product housing. The products that are currently fitted with an old energy label will be allowed to remain in the aisles until the inventory is cleared. The exceptions include distance selling, web sales, and other sales methods where the buyer is not able to see an exhibited product; for such sales, the provisions of the Regulation will be fully effective as of April 2012.